Finding the best chicken incubator may seem hard at first, but the following short paragraph will give you all the information you need to make a good choice. After a careful analysis of the models available for sale, we have concluded that the one to get is the GQF Manufacturing Digital Sportsman. This nifty choice features an onboard computer that will monitor the systems and the environment inside the incubator and will share the information with you so that you are always up to date. The temperature and humidity are very easy to read on the generous LCD display. All the three racks will turn the eggs automatically so you won’t have to babysit the machine. In the event that our first model is not available at your favorite shop, but you still want to get a good chicken egg incubator, we recommend the Brinsea Ova-Easy 380. With this incubator, you get the benefit of an onboard computer that will monitor the environment and the systems every second to keep itself updated and to share the latest data with you. All the information will be displayed on the LCD screen while the three racks will turn the eggs automatically. Customers have reported that the unit could have benefited from a better construction and that the water tends to run out quickly. 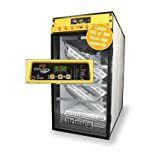 If you don’t want to waste precious time checking the humidity and temperature, this incubator will do all the hard work for you so that you can focus on your more important tasks. The factory assembled device is ready to use right out of the box and comes with the company’s Advance fully digital control system that is very accurate and easy to use. The temperature and humidity are displayed continuously together with the egg turning status and a temperature alarm. The only complaint came from a customer who received the wrong user’s manual but the company was quick to rectify the issue. You can’t go wrong with a Brinsea egg incubator and this model is no different. It is highly programmable, suitable for a wide range of egg sizes, and energy efficient. The 1550 model is designed to allow for the best hatching and since this is a hatcher incubator, it will operate at different humidity and temperature to obtain optimal hatching. This option features five hatching drawers with a total capacity of 1250 quail eggs or 360 chicken eggs. It is also very quiet and easy to clean. There is no easy way to access the back of the unit and that is unfortunate since the back of the fans tends to get dirty with fluff after some time. This is a more affordable model that retains most of the features that are usually found in expensive machines. Customers are satisfied with its quality and reliability. If you are looking for a high-quality chicken egg incubator for sale, our diverse list below will show you the models that have garnered high critical acclaim and that offer the features, reliability, and performance customers need. This particular model comes with an accurate digital thermostat that will let you monitor the incubation temperature for chicken eggs through the bright and generous LCD display. The onboard computer does all the hard work for you and will monitor the systems and the environment every second and will then share all this useful data with you. You get a complete machine that acts both as an incubator and as a hatcher, and it even has electronic egg turning control while the audio and visual indicators will let the users know at all times what is happening with the eggs. When it comes to quality, going for a GQF device is a no-brainer since similarly to their other offerings, this one too is carefully assembled by hand by a team of skilled craftsmen and has been tested for a full 24 hours in order to ensure proper calibration and operation. This model is very versatile and it can be used even by people that are just getting started with a small flock since it is very easy to use and it does not require too much monitoring. The total capacity of the incubator with the plastic trays included is 270 chicken eggs, 1368 quail eggs, 354 pheasant eggs, 198 turkey or duck eggs, and 36-45 large eggs. Thanks to the use of a high strength plastic board, the incubator remains very well insulated, quiet when operating, and very easy to clean. The temperature and humidity are set automatically and that will help eliminate any guesswork so that all your eggs hatch properly. Putting the machine together is not difficult at all, especially since it comes with a good set of directions. Some customers were not entirely pleased with the automated turning process which seemed a bit complicated and awkward for them. Brinsea is a brand that is known for the quality and reliability of its products, and the Ova-Easy 380 is no exception. In fact, the main goal of the manufacturer was to construct an affordable model that can perform better than any other alternatives available in this price range. The overwhelmingly positive reviews have us convinced that they succeeded. 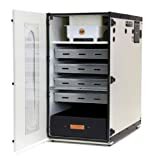 This is a cabinet incubator that is equipped with Brinsea’s own and proved Advanced fully digital control system that provides accurate readings and that is very easy to use even by those with no prior experience in this field. The incubation temperature and humidity are displayed continuously so that you can always tell if things are working properly. Additionally, this option comes with a programmable automatic egg turning system that you can set up in 30 to 180-minute intervals. This feature is a very welcome addition since it will make the task of looking after the eggs that much easier. You get automatic temperature control in both Fahrenheit and Celsius, and if something causes the temperature to reach a higher or lower level then advised, an alarm will ring. The high capacity of the machine allows it to house up to 384 hen eggs, including 96 in the integral hatching trays and is suitable for a wide range of egg sizes. The unit is energy efficient and has an insulated cabinet that will keep the temperature at the right level without drawing too much power. You won’t have to worry about cold spots damaging your eggs since with this option you get the benefit of a unique “laminar airflow” that eliminates this danger entirely. You get a set of six universal egg trays and two covered hatching trays for free included with your purchase. One customer has complained that he or she received the wrong user’s manual but thankfully the seller was very quick in solving this mistake. The 1550 model is designed to offer the best hatching conditions and will help free up your incubator so that you can get even more eggs ready for hatching. To this end, the machine will operate at temperature and humidity settings that are slightly different and that will allow the environment inside the hatcher to reach the optimum levels for the hatching process. You can still use this versatile machine to set eggs if you wish so, but you will have to turn them by hand. Similarly to other GQF models, this one too comes with an onboard computer that will monitor the environment and the machine’s system to ensure that everything works as it should and that the eggs get the temperature and humidity they need. Customer feedback is very positive with many of the owners praising the quality, ease of use, and versatility that this machine offers. The construction sees the use of a high strength plastic board which does not only confer the product increased durability, but will also make it better insulated, easier to clean, and much quieter. The thermostat can operate between 60 and 103 degrees Fahrenheit, depending on the temperature of the room you place it in. The hatcher comes with five hatching trays and four hatching tray covers, one moisture pan with two wick pads, and a comprehensive instruction booklet. The total capacity of the product is of 1250 quail eggs or 260 chicken eggs, making it the perfect choice for anyone looking to hatch many chicks. On the front, the easy view door allows you to see what is happening with the eggs in real time while the audio and visual indicator will keep you well informed. The corners are not rounded and that makes them quite difficult to clean if you don’t have the right tools. The Ova-Easy ADVANCE 100 is a high-performance alternative suitable for a wide range of egg sizes. Compared to the other Brinsea incubators, this one is a smaller version but comes with the same features that customers have grown to like. It is fitted with the Advance fully digital control system that will keep the temperature at the right level. The product comes fully assembled which makes it perfect for people that don’t like to spend time studying instruction booklets and want their products to come ready to use right out of the box. Furthermore, the machine features a high-quality construction which will guarantee long-lasting service. As far as capacity is concerned, this model can accommodate a maximum of 96 hen eggs, making it ideal for people that are looking for a versatile machine that is not too big nor too small. As a plus, it also comes with a two-year warranty. Included in the package you will find a set of two universal egg trays that feature adjustable dividers and two hatching covers, a $70 value included for free. The observation door is clear and double-glazed for easy visualization and to ensure that the glass won’t dissipate the heat. The unique “laminar airflow” will eliminate cold spots entirely so that you can rest assured knowing that all the eggs will get the same temperature. The machine comes with programmable automatic egg turning at 30 and 180-minute intervals, a great feature for amateur or busy farmers. One new feature with this model is the addition of a button that with a single press will level the shelves for easier tray access. Unfortunately, if you want to get fully automatic control of the humidity you will need to purchase the advance humidity pump separately. If you only need to hatch a few eggs, this small incubator is the perfect choice since despite its smaller size it does not compromise when it comes to features and reliability. The incubator is fully automatic and will turn and then autostop the eggs two days prior to hatching so that the embryo health is maintained. The unit is also extremely easy to use since it is menu-driven and allows you to program the length of incubation that you want depending on the types of eggs you have available. Once everything is set up, the microcontroller will take charge and will maintain the current temperature, turning frequency, and length of the incubation period with almost no input required from the user. The only thing you will need to do is top up the basin periodically with water in order to maintain the proper humidity levels. The unit has a capacity of seven eggs and you can purchase an optional insert that will allow the device to hold 12 smaller eggs. While the temperature is set at 99.5 degrees Fahrenheit, you can still customize it fully to meet the needs of the eggs that you want to hatch. The incubator incorporates the Biomaster anti-microbial additive designed to prevent the growth of harmful bacteria and help keep an optimum environment for hatching. The clear dome design offers excellent visibility, and addition that makes the incubator ideal for learners, hobbyists, or even for teachers that want to show how eggs hatch in the classroom. Brinsea is very confident in the quality offered by this product which is why it includes a 3-year limited warranty. The turning intervals and turning angles are fully programmable, and once they are set, the machine will do all the hard work for you automatically. While this is a small incubator, the price is anything but that, and many users have found the product to be too expensive. If you are looking for a cheap chicken egg incubator, the IncuView model is designed as an alternative to the other expensive tabletop options available on the market today. It comes with many of the features usually found in high-end machines and will help you manage the critical factors such as temperature, humidity, egg turning and hatching period. The thermostat included in this model will control the temperature automatically by varying the amount of power supplied instead of turning the heater on and off. This feature helps achieve a precise and constant temperature which, in turn, will improve the hatch rates of your eggs. Humidity is also easily controlled with the help of the flow-over humidity rings which let you add just the right amount of water that the device requires. Furthermore, the built-in automatic egg turner will roll the eggs gently for the specified number of turns that you set. Both the temperature and humidity are fully adjustable while the digital display will make it very easy for you to see the current readings and make adjustments accordingly. Speaking of the temperature, you will get a very precise value since the IncuView features a 40-watt heater that varies the amount of power that it uses instead of simply turning itself off and on. Instead of showing the humidity levels in percentages, this option utilizes a more customer-friendly approach and shows the range you should keep the humidity for each phase of the incubation cycle. Additionally, the built-in hatch timer will keep track of the days left while the clear dome lid provides a panoramic and clear view of the eggs. Some reviews have mentioned that the humidity fluctuates a lot and that the product is not designed to last since it can break after some months of use. The HovaBator Deluxe kit includes a thermometer, a snap action thermostat, and an easy-to-clean sanitary liner. The incubator itself is made from durable Styrofoam which helps it retain warmth and keep the temperatures to a constant level so that you can be certain that all your eggs will hatch and that the chicks will be healthy. Furthermore, the incubator has two 5×4” viewing windows to let you examine the status of the eggs but that will work just as great for educational purposes since kids will get to witness the entire process from start to finish. The liner has moisture rings built-in and you can fill them when you want to change the humidity level. The IncuTurn automatic egg turner will roll the eggs six times per day, similarly to how they are turned by the hen. Additionally, the egg tray is universal and it can accommodate different sized eggs. A great feature of this option is the universal egg tray holder that will save you the money and trouble of having to buy expensive racks for different egg sizes. The thermometer and hygrometer measure the temperature and humidity very precisely and you can change between Celsius or Fahrenheit depending on your preferences. The installation process is very simple, getting this option up and ready to start incubating should not take more than a few minutes. This alternative is very compact and comes with a large LCD screen that apart from the current reading, will also display a history of the high and low humidity and temperature levels. This option runs on batteries thanks to its cordless design and it comes with a compatible battery included in the package. We found reports of the egg turner system not working as expected, with customers saying that it can stop working altogether. With the Kemanner Automatic 48 Digital, you get another affordable alternative capable of accommodating up to 48 eggs, depending on their size. It requires 80W of power and it is energy efficient, making for an environmentally friendly choice. This product works great for incubating chicken, duck and other fowl eggs. As far as the construction is concerned, you get the benefit of durable plastic that will guarantee proper operation for years to come. Despite the low price point of this machine, you still get to enjoy automatic egg turning every two hours so that you can stop worrying about having to do it all by hand. We are also glad to report that customer feedback is mostly positive with many of the owners praising the performance of the product. There are also many reports saying that leaving the incubator in the Styrofoam package can help it regulate the temperature better. The LED screen is very easy to read and it shows all the data that you need including the temperature, humidity, and the approximate hatching date. If the temperature or the humidity reaches dangerously low or high levels, the device is fitted with an alarm that will ring to let you know. The ideal temperature and humidity are achieved thanks to the built-in fan that helps circulate the air evenly so that every egg is treated equally. Despite the low size and cost of this model, its versatile design is suitable for incubating chicken, duck, and any other fowl eggs. The instruction booklet can be hard to read since the manufacturer has decided to use extra-small type. While the incubator can turn the eggs every two hours, it is not designed to switch the side after turning every time, but that should not have any major negative effects on the eggs. The straightforward design and the accessible price of the Magicfly Digital Mini make it the ideal purchase for anyone looking to hatch eggs the easy way. The incubator is so easy to use that it will soon become the center of attention for your kids and family. Kids can use it to learn the basics of incubating eggs and how to be responsible. You can use it to start incubating chicken, geese, and ducks and the product can accommodate up to 12 eggs. As mentioned above, you won’t have to worry about complicated designs or products that require any prior knowledge. All that you will need to do is add the fertilized eggs in, and the machine will do all the hard work for you. Furthermore, while the unit may seem fragile at first glance, the solid molded construction is very sturdy and capable of giving you the performance and durability that you require. You don’t need to turn the eggs manually since this model comes equipped with an automatic egg turner. The temperature is controlled automatically meaning that the incubator will provide the eggs with just the right conditions to keep the embryos healthy. There is no assembly required with this option, the incubator comes ready to use out of the box and all you will need to do is add the eggs and then plug the device to the nearest power outlet. The compact design will allow you to place it almost anywhere and when it is not in use you will have no difficulty in finding a place to store it in. While the incubator can hold the temperature, we found reports saying that the company did not calibrate the device to the right temperature which means that for the best results, the users might be required to calibrate it themselves. The Ridgeyard incubator is large enough to accommodate up to 56 eggs and it comes equipped with a fully digital smart control system from which you can control and display the humidity, temperature, and incubation days. This intelligent addition makes it very easy for users to be aware of the status of the eggs and how far or close they are from hatching. The humidity and temperature levels are kept at the proper levels with the help of the built-in brushless fan that will circulate the airflow to keep the environment inside the machine optimal for hatching eggs. If the temperature or humidity are ever out of the settled range, the unit is equipped with an alarm to alert the user. Another great addition to this model is the LED candling lamp that will let you see if each egg is fertilized so that you can eliminate the ones that are not likely to hatch. The high-quality heater will maintain the temperature at a constant level so that there are no cold spots that could affect the eggs’ chance of hatching. You can illuminate all the eggs at the same time with the press of a single button so that you can see which ones are fertilized and which ones are not. The product boasts a simple design and the clear lid will allow kids and families to learn the basics of incubating chicks, making it perfect for demonstrations and lessons. You can add water through the water filling hole using the included water bottle and you won’t have to unplug the machine when pouring the liquid. It will turn eggs automatically every two hours, a feature that will save you the trouble of having to do it by hand. If you lose power, the unit will not turn back on by itself unless you push the power button again. This new model from Incubator Warehouse includes a cutting edge digital control center that displays and controls both temperature and humidity. The Genesis incubator is pre-set for bird eggs and is very easy to operate since all you will need to do is plug it in, add water, and then the eggs. There is nothing for you to set up or adjust if you don’t want to. The machine is pre-set to 99 degrees Fahrenheit and like all incubators, it requires a stable room temperature and should not be used in areas like barns or sheds. Since you won’t have to worry about adjusting the temperature or humidity by hand with each use, this incubator will consistently deliver good hatches. If you are a proficient user and want more freedom, the thermostat can be adjusted and you can set it as low as 80 degrees Fahrenheit if you wish to use it with reptiles. Apart from the incubator, the kit also includes an egg candler and the IncuTurn automatic egg turner that will gently roll the eggs six times per day. The egg tray is universal which means that it can easily accommodate different sized eggs such as goose, quail, turkey and chicken eggs. The clear plastic tray allows you to control the humidity since you will be able to see when it is time to add more water by simply taking a quick look into the tray. The 12 Volt system is safe and TUV listed, allowing you to use this versatile incubator in classrooms or at home to show kids how the hatching process works. After taking a look at the customer reviews we noticed that some units come with thermostats that are a bit off and show the wrong temperature, and that can lead to some eggs not hatching. Hatching chicken eggs in an incubator is not very hard and you don’t need an expensive machine, especially when you have alternatives such as the Widen Electric 24 Egg. As you’ve probably guessed from the name, this model can accommodate up to 24 eggs and comes with auto turners to make the entire process that much easier for you. This versatile choice is suitable for incubating chicken, duck and any other fowl eggs but it is not big enough for eggs that are larger than those of a goose. The machine comes with built-in water channels to help control the humidity levels. To this end, the manufacturer also includes a free water bottle to make it easier for you to add extra water. There is not much that you will have to do once you’ve set up the incubator since the machine comes with alarms that will alert you every time when you are needed. You won’t have to guess when it is time to add more water since the product has an alarm that will go off and alert you if the humidity level needs to be raised. The LED display shows all the useful information including temperature, humidity, egg turning time, and hatching day. 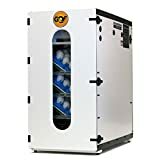 The incubator is made of durable ABS which will confer it increased durability and will make the cleaning process straightforward since dirt and stains will be easy to remove. Anyone can use this product thanks to its simple design and the easy-to-understand instructions included in the package. The eggs get turned automatically every two hours to help increase the chance of getting a viable embryo. It can be difficult to know how much water is present in the channels and customers would have preferred the tray to be made of clear plastic. In your search to find the best incubator for chicken eggs, you will most likely encounter dozens of models and while they might seem similar in certain ways, there are many features that differentiates them. We seek to make it easier for you to select the right model for your needs, which is why we have examined some of the popular reviews of chicken incubators to help us identify the key features and factors one ought to consider before purchasing this type of product. Take a quick look below and see for yourself. When choosing an incubator, you will have to decide between manual or fully automatic control. Machines that are manual, while cheaper, will require quite a lot from the user since you will have to remember to turn the eggs twice a day by hand and make sure that the temperature and humidity are never too high or too low. A fully automatic turning incubator, on the other hand, will do all the work for you and will turn the eggs at the right time. The only thing that you will need to do is to add water every couple of days. Additionally, a built-in thermostat can help regulate the temperature to the right values automatically while fans can help distribute the heat uniformly within the whole unit. Most high-quality automatic and manual incubators come with an LED display that enhances the accuracy and efficiency of the product. Whether you go for an automatic or manual product, we recommend that you get a unit that allows you to control all the aspects of the machine. Having the ability to control humidity and temperature to your preferred values will help you use the product to incubate all types of eggs, not just chicken. Another factor that you should take the time to think about is if the incubator uses still air or forced air to heat the unit. Forced air incubators use a fan to circulate the warm air so that the temperature is constant in every part of the unit. The still air alternative, on the other hand, does not have a fan and because of this, the heat forms in layers inside the incubator. Thus, the temperature between the top and bottom of the product is different. If you have to choose between the two, unless you are on a very tight budget, the forced air model is vastly superior since it helps ensure an even distribution of temperature, humidity, and fresh air. Incubators can range in capacity from three eggs up to hundreds and hundreds of eggs, so it is very important to know what your intended use for the product is before you purchase it. If this is your first time hatching eggs, it is worth going for a smaller unit and see how you can manage with it before you go for the big ones that seniors in the field use. Similarly, you also need to keep in mind that there are all kinds of uses or purposes that an incubator can be purchased for. While the primary purpose is undoubtedly that of incubation and hatching, you can also use it for educational or laboratory purposes, subsistence farming, big commercial production or simply as a novice. The purpose you have in mind will dictate the type and size of the incubator to buy. Thus, it is illogical to purchase a 100 or 50 egg incubator for laboratory or educational purposes. Similarly, if your dreams are of becoming a major chicken producer, you should go for high-capacity models that can accommodate hundreds of eggs. The material that the product is made of is very important and plastic is the best choice when looking for high-quality chicken egg incubators. Some models are made of Styrofoam which is not a bad material per se, but it can be very difficult to clean. Speaking of cleaning, this is another aspect you ought to remember since while hatching eggs is a very fun activity, cleaning the mess afterward is anything but that. As the chicks dry out, there will be plenty of fine fluff floating that could get in every little corner. All the corners and areas of the unit should be easily accessible so that you can scrub and sterilize them when needed. If not, since the incubator temperature for chicken eggs is perfect for microorganisms to multiply quickly, your new purchase could soon become a health hazard. The chicken egg incubation time is twenty-one days and they need to be kept at 99.5 degrees Fahrenheit at all times. Even just one degree higher or lower can terminate the embryo which is why it is very important to get a product that can keep the value of the temperature constant. The humidity should be kept at around 40 to 50% for the first 18 days, while for the final days before hatching, the required humidity is of 65 to 75%. Furthermore, since egg shells are very porous, and they allow oxygen to enter and carbon dioxide to exit, the incubator should have vents or holes that allow fresh air to circulate so that the baby chicks can breathe.